Deutsche Bank says everyone else is wrong about this airline. It's a bleak day for investors, with stock market averages initially plunging in the wake of last night's election. (They seem to be getting over that, however.) Meanwhile, over at Copa Holdings (NYSE:CPA), they're darn near throwing a fiesta: Deutsche Bank just upgraded their stock. Given the president elect's stated antipathy to all things south of "the wall," that might seem strange. Then again, Copa Holdings' growth track isn't likely to be held up by a wall. It'll just fly over it. For those who aren't familiar with the name, this is because Copa Holdings is an airline. Here are three things to know about Deutsche's recommendation. 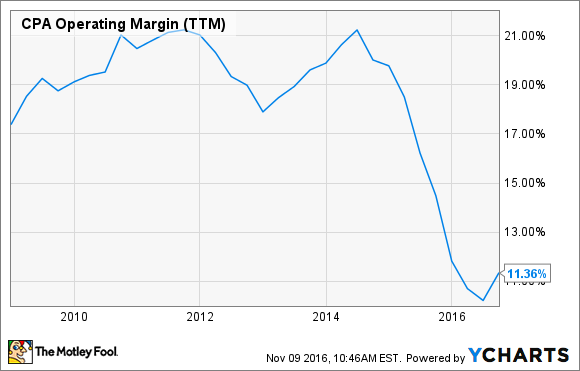 Copa Holdings' operating margin has come a long way...down. But Deutsche Bank thinks it's about to ascend sharply. CPA Operating Margin (TTM) data by YCharts. 1. What is Copa Holdings? Boasting a mixed fleet of 100 Boeing 737 and Embraer E-190 aircraft, the Panamanian carrier is one of Latin America's fastest-growing airlines. It flies routes throughout the region, and to and from more than a dozen U.S. cities as well. According to data from S&P Global Market Intelligence, from the time of its 2005 IPO to today, Copa Holdings has more than trebled its revenue, reporting sales of $2.15 billion over the past 12 months -- but net losses of $164 million. Now $164 million in losses sounds pretty bad, I'll grant you. But before you get too worried about that, understand that the entirety of Copa's losses can be explained by losses on currency exchange rates -- $440 million worth over the past 12 months. On an operating profit basis, however, Copa Holdings is actually OK. The airline generated operating profits of $233 million over the past year. And as Deutsche points out, management just affirmed that it will not only meet its previous guidance of 11% to 13% operating margin in 2016, but come in toward the upper end of that range (12% to 13%). Furthermore, as StreetInsider.com points out, Copa expects to earn 15% to 17% operating profit margin in 2017. These numbers are key to Deutsche's decision to upgrade Copa Holdings stock. According to the analyst, most other analysts following Copa Holdings currently anticipate no better than 14.5% operating margin in 2017 -- whereas Deutsche is modeling for Copa to earn 16.5%. This has Deutsche expecting $8.05 in net profits from the company next year (about a buck-fifty more than everyone else is predicting, and $0.55 per share more than Deutsche previously thought possible). According to Deutsche, these new profits will be enough to lift Copa Holdings stock to $105 a share (up from $95 and change today), deliver a 10% profit to new buyers -- and make the stock a buy. So if we assume Deutsche Bank is right about Copa's profitability, and everyone else is wrong, what does this mean for investors? Currently, consensus estimates call for Copa Holdings to earn $6.48 per share this year, and actually a bit less than that next year. Given this, the idea of paying 14.7 times earnings for a company with shrinking earnings might not sound attractive. Deutsche's view, in contrast, is that Copa will grow its earnings 24% between this year and next -- a situation which would make 14.7 times earnings a bargain price. Throw in a tidy 2.2% dividend yield as a bonus, and I think Deutsche has itself a pretty strong argument for recommending the stock.